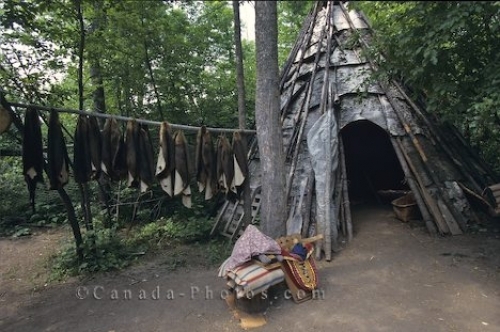 A wooden teepee and pelts hanging to dry are signs of early life at Old Fort William in Thunder Bay, Ontario in Canada. Life as we know it now is nothing like the years between 1803 and 1821 when animal pelts were hung to dry, people created a wooden teepee as a place to live and food was hunted and cooked on an open fire. At Old Fort William in Thunder Bay, Ontario you can experience this type of life and see what people went through to survive every day of their lives. Old Fort William shows life between 1803 and 1821 Thunder Bay, Ontario, Canada. Picture of pelts and blankets outside a teepee at Old Fort William in Thunder Bay, Ontario in Canada.